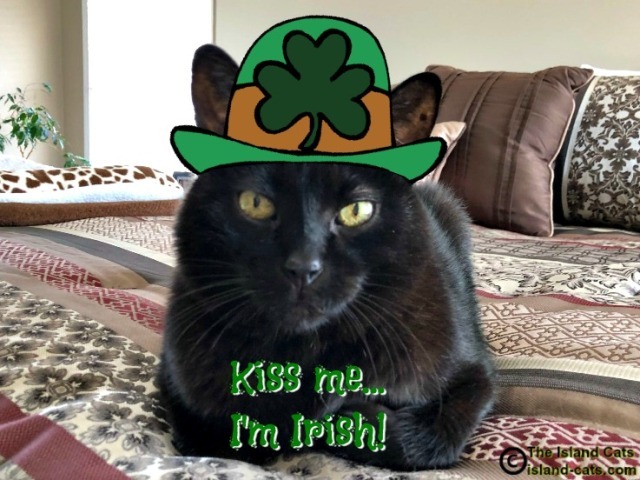 McErnie’s St. Patrick’s Day Selfie – The Island Cats…Every Cat wants to be an Island Cat! Top o’ the day to you! It’s me…McErnie…wishing you all Happy St. Patrick’s Day! On St. Patrick’s Day, we’re all Irish! I’m pawticipating in The Cat on My Head Sunday Selfies Blog Hop. To join the hop or to see other fun selfies, click HERE. Well there handsome mancat McErnie, you can bet if I lived close enough I’d be the first in line for one of your kisses! Happy St. Patrick’s Day!! Happy St. Patrick’s Day, McErnie! I’m in line waiting for my kiss! Happy St Patrick’s Day! We would kiss you ANY day! MOL! You make me smile handsome McErnie! Happy St. Patrick’s Day – may the luck of the Irish be with you all! You look terrific Ernie! Happy St. Patrick’s Day from all of us! We must be Irish, because we feel really lucky to see you today, McErnie! Oh, Mc Ernie, do you want to take us all down to the pub for a pint??? Happy St. Catrick’s Day, McErnie! Ernie I’d kiss you no matter your nationality. Green is definitely your color. Ernie I would kiss you any day! Not just on St.Patrick’s Day! Ernie you are so adorbale! You look quite handsome in green, McErnie! Happy St. Patrick’s Day! Hooray for being Irish, Ernie! I’d kiss if I could! Happy St. Patrick’s Day Ernie and family! You look totally fabulous! Have a wonderful Sunday, and a happy St Gertrude’s Day. Happy St. Catrick’s Day, Ernie and family. Mew mew mew McErnie yore McMarvelluss!!!! What a cute little leprechaun you are!!! Mom says, her pleasure to slap one on you. I hope you had an awesome St. Patrick’s Day, Ernie! Ernie you are totally rocking the Irish look my friend………!! Hope you all had a wonderful St. Pat’s Day! Hi McErnie! I hope you had a wonderful St. Patrick’s Day! Stepping Up My Game Who’s That With Those Skinny Legs?